Bryan Oviedo scores late to win it for Everton at Manchester United to stretch their unbeaten run to seven games. 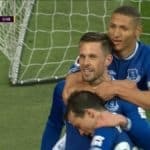 Roberto Martinez opted to restore Kevin Mirallas and Ross Barkley to Everton´s starting line-up at the expense of Leon Osman and Gerard Deulofeu, who earned widespread plaudits in his first Premier League start against Stoke City on Saturday. Everton started well, and Mirallas almost marked his recall with a goal inside the opening ten minutes, when running at pace, he cut in and stung David de Gea´s palms with a right-foot drive from 20 yards out. Man Utd started to wrestle the game back around the 15 minute mark, when Tim Howard had to be alert, saving well to deny Rooney at his near post and the American keeper done well to follow it up to Shinji Kagawa and Giggs saw his attempted header flash wide of the far post as United got into their stride. Howard was beaten on 28 minutes, but Rooney´s deflected effort come back off the post. But Everton continued to go toe-to-toe with Man Utd throughout in a way so few teams did during Sir Alex Ferguson´s time at the helm. Romelu Lukaku was a constant threat, forcing De Gea to save with his feet just before the interval. Everton started the second half strong – Gareth Barry and James McCarthy dominating the midfield, forcing Moyes to replace Kagawa and Rafael with Nani and Adnan Januzaj just 12 minutes into the second half. 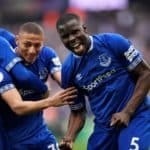 Everton continued to boss the midfield, Oviedo had an effort go wide of the post before Wayne Rooney was booked for a dirty, cynical lash-out on England team-mate Phil Jagielka. Ross Barkley struggled with his decision making throughout and was replaced by Deulofeu on 69 minutes and the Spaniard really should have opened the scoring within seconds of coming on. Lukaku had played him in down the right, but when faced with De Gea the youngster seemed to be in two minds and managed only a tame effort on goal. Fortune then favoured the brave as United were twice thwarted by the frame of the goal when Evra´s header was tipped onto the crossbar by Howard and Danny Welbeck headed the rebound against the bar from eight yards out. 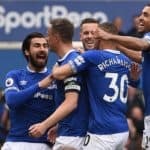 Mirallas saw his free-kick tattle the post but Everton weren´t to be denied their first Premier League success at Old Trafford in 21 attempts when Oviedo (Baby) got on the end of an Lukaku cross to score from an acute angle at the back post on 86 minutes to spark absolute limbs in the away end. Everton manager Roberto Martinez achieved a result at the first time of asking that avoided Moyes in his 11-year managerial career at Goodison Park. What Moyes could not achieve in 46 league games, over his 11 years, his successor, Roberto MartÃ­nez, has managed at the first attempt.